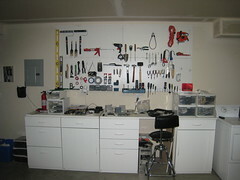 Last weekend we doubled the amount of cabinets and work surface and quadrupled the amount of pegboard space. Sometimes I get a spam email or blog comment that makes me chuckle. Like this one. Hello, my name is Anna! As you can probably tell, I’m a Christian woman who loves Jesus Christ and cares for all humans, even the wicked. What you probably don’t know is that I’m hot. My picture below isn’t really that good. I want to use my beauty for GOD, and want to encourage Christian women (my sisters in Christ) to do the same, according to the Great Commission. I was trying to learn a bit about JBoss AS by following their Getting Started doc/tutorial. When I got up to Chapter 4, which involves building and deploying the “Duke’s Bank” application from Sun’s J2EE tutorial to JBoss, I ran into errors when trying to compile. Later on in the tutorial, you are directed to run an Ant task to display some newly inserted rows in the hsql database. For some reason, I didn’t have the hsql-list.sql file. So I created one with SELECT * FROM account; as its contents. Aside from these hiccups, the the tutorial worked fine. Full Circle Magazine is an e-magazine run by the Ubuntu community that covers the world of Ubuntu, open source, and technology. Did Tony Soprano get whacked?